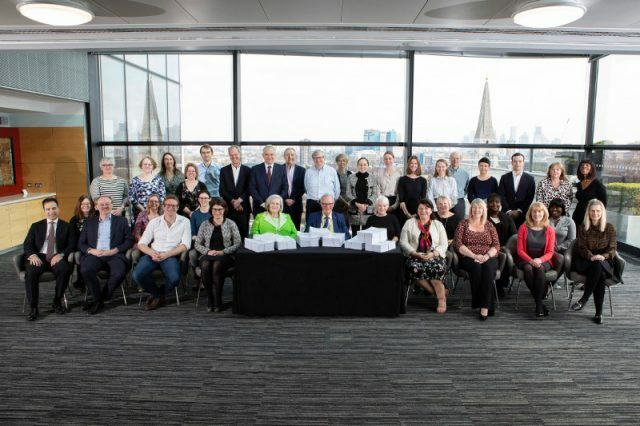 March 2019: Below is a photo of the people who made a special contribution to the completion of the re-write of Philip Wood’s books on the law and practice of international finance, the draft of which has just been delivered to the publishers. The books comprise nine volumes. They amount to 7500 pages and three million words equivalent to 60 PhD theses. They were written at the rate of one book every six weeks over the past 11 months. This photo was taken as an archival historical photo since the publishers say that this is the first that anybody has delivered so many books to them at the same time. It is also believed to be the first time in world legal publishing that somebody has completed summaries of the relevant law concerned in all 321 jurisdictions of the world from Abu Dhabi to Zimbabwe.